The ‘Ray Chair’ is an excellent example of contemporary international furniture design that follows the growing trend that looks towards the natural world for inspiration. In the case of the ‘Ray Chair’ it is the growth of crystals in which he finds his inspiration. The inspiration for his other chairs including the ‘Clover’ and ‘Blossom’ is self-explanatory but antlers, bones, and microscopic cellular arrangement have been nominated by him as his muse for others designs. 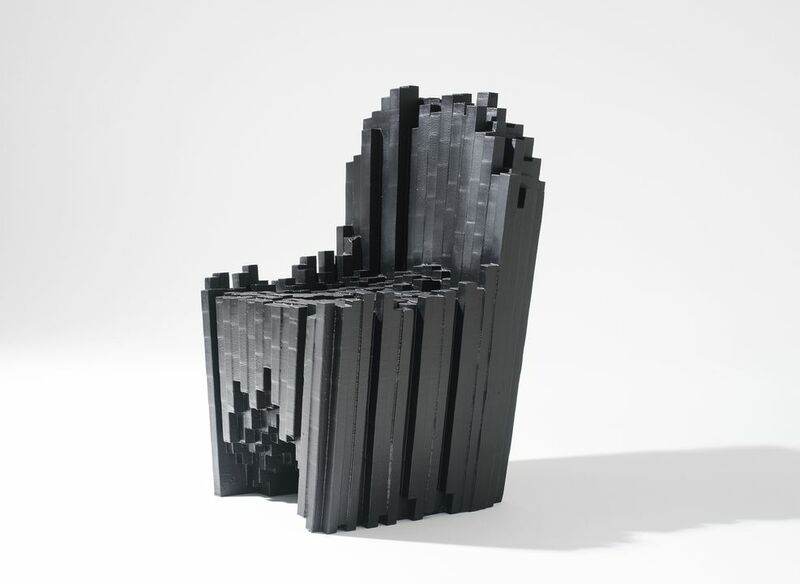 Tall chair constructed from vertical columns of square-sectioned multiple strips of rubber foam sealed with an elastic polymer skin giving a crystalline appearance akin to the basalt columns of the Giant's Causeway' in County Antrim, Northern Ireland. The 'Ray Chair' is a descendent of designs by renowned fellow-Italian designer, Joe Colombo (1930 - 1971). Colombo's schemes for his 'Additional Living System' (1967) and the 'Visiona' 'habitat of the future' concept (1969) similarly took advantage of the sculptural freedom (with comfort) offered by polyurethane foam. Antonio Pio Saracino (born 1976) is an Italian-born architect and designer, living and working in New York and Italy. In 2003, Saracino graduated in Architecture at 'La Sapienza' University of Architecture in Rome, where he then worked as assistant professor of architectural design. For the following two years, he worked with several Italian and US architectural firms including Massimiliano Fuksas in Rome on the project for the Palazzo Congressi. Since 2004, he has collaborated with New York-based architect Steve Blatz on interiors, conceptual projects and design competitions, including Seed House, a pod-shaped residence, and winner of the American Architecture Award in 2007 by the Chicago Museum of Architecture. Saracino is a four-time winner of the Future Furniture design competition sponsored by Interior Design magazine, New York. His projects have received extensive coverage in architecture and art publications in Italy, France, Belgium, the United Kingdom, the Netherlands, Russia, Japan, Korea, Brazil, the US and Australia. His design work for Tibi boutique in Soho, New York (2007) was featured in Interior Design's 'Best of the Year' issue and the 'Global Shop' section of Wallpaper. He was also named one of the world's 25 most interesting trendsetters by ARTnews magazine, New York. In 2007-2008 Saracino was selected as the winner of the Agorafolly art competition in Brussels, Belgium, to create a work celebrating the 50th anniversary of the European Union. His large-scale installation was mounted in front of the Central Train Station. For more than a decade, Saracino's designs and work have been shown in solo and group exhibitions in Rome, Venice, Trieste, Brussels, London, Athens, Moscow, Cordoba, Sao Paulo, Mexico City, New York, Washington and Sydney. This 'Ray Chair' was displayed at the Arteral gallery in Rozelle from where it was purchased by the Museum.